Aliquippa, Pennsylvania is famous for two things: the Jones and Laughlin Steel mill, an industrial behemoth that helped win World War II; and football, with a high school team that has produced numerous NFL stars including Mike Ditka and Darrelle Revis. But the mill, once the fourth largest producer in America, closed for good in 2000. What happens to a town when a dream dies? Does it just disappear? 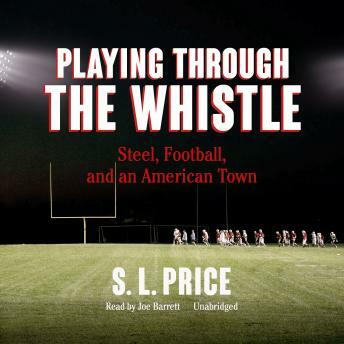 In Playing through the Whistle, celebrated sports writer S. L. Price tells the story of this remarkable place, its people, its players, and through it, a wider story of American history from the turn of the twentieth century. Aliquippa has been many things-a rigidly controlled company town, a booming racial and ethnic melting pot, and for a brief time, a workers' paradise. Price expertly traces this history, while also recounting the birth and development of high school sports, from a minor pastime to a source of civic pride to today, when it sometimes seems like the only way out of a life of poverty, drug abuse, and crime. Playing through the Whistle is a masterpiece of narrative journalism that will make you cry and cheer in equal measure.